What first shuts off (“quenches”) a galaxy’s star formation? What keeps star formation from restarting? Several mechanisms have been proposed to answer the first question. Initial quenching of star formation could be due to one (or a combination) of three mechanisms. A series of supernova explosions could heat the gas, and hot gas cannot collapse easily to form stars. Mergers with other galaxies could knock the gas out of the galaxy, or an Active Galactic Nucleus could heat or blow away the gas (known as AGN feedback). The second question has proved more difficult to answer. Recent observations show that all galaxies (even quiescent galaxies!) are surrounded by a massive reservoir of cool, low-density gas. This gas will be slowly pulled onto the galaxy, where it ought to serve as fuel for new star formation. Even if star formation has been quenched at one point (say by an onset of AGN feedback, or a large merger event), something must stop this fresh gas from forming new stars if galaxies are to remain quiescent. The authors suggest that a process they call AGB heating could fit the bill, keeping this gas from forming stars over long periods of time. Asymptotic Giant Branch (AGB) stars are intermediate mass stars (about a half to a few times the mass of the Sun) that have finished most of their hydrogen-burning lives: they are running out of fuel in their cores. They are not massive enough to go supernova when they die, but they do lose large amounts of mass when they eject their outer layers. In most cases, this mass loss forms a beautiful planetary nebula but does not release very much energy. However, if the AGB star is moving rapidly through the surrounding gas, the ejected mass could deposit much more heat into it (see Figure 1). Galaxies with high velocity dispersion ought to have many stars with high enough speeds to accomplish this. Such galaxies are also more frequently quiescent. The authors investigate whether this heating mechanism could keep the gas surrounding a galaxy from cooling to form stars. Figure 1: An illustration of AGB heating. The left image shows the Hertzsprung-Russell diagram of stellar evolution: stars evolve from the “main sequence” up the “giant branch” . As a star evolves through the Asymptotic Giant Branch (AGB) stage (upper end of the giant branch), it will usually shed its outer layers slowly as a Planetary Nebula (PNe, upper right). If it is moving fast enough through the nearby gas, the layers instead could be stripped rapidly from the star (lower right). The authors suggest this “AGB stripping” could heat the gas and prevent new star formation. Figure 1 from Conroy et al. 2014. The paper’s main goal is to compare the strengths of two processes in the gas: heating and cooling. Heating involves adding energy to the gas, raising its temperature and causing it to expand (think of the ideal gas law). Supernova and AGN feedback are the usual suspects for heating galaxies, but here the authors focus on the proposed AGB heating mechanism. Cooling in galactic gas is dominated by radiative cooling: the gas emits photons (via atomic transitions) which remove energy from the gas. This lowers its temperature and causes it to condense. For a gas cloud to collapse and form stars, radiative cooling must be more powerful than any processes heating the gas. The authors compare AGB heating to radiative cooling to estimate whether it could prevent star formation. They make an analytic calculation of both heating and cooling rates, meaning they use simple physical arguments to determine how much energy ought to be added or removed from the gas, as a function of various properties of the galaxy. They adopt reasonable estimates for several of these values (for example: the average age of galactic stars), and focus on how heating and cooling depends on three important quantities: 1) the stellar mass of the galaxy, 2) the total mass of its dark matter halo, and 3) redshift. Results: Don’t Discount Heating from Evolved Stars! 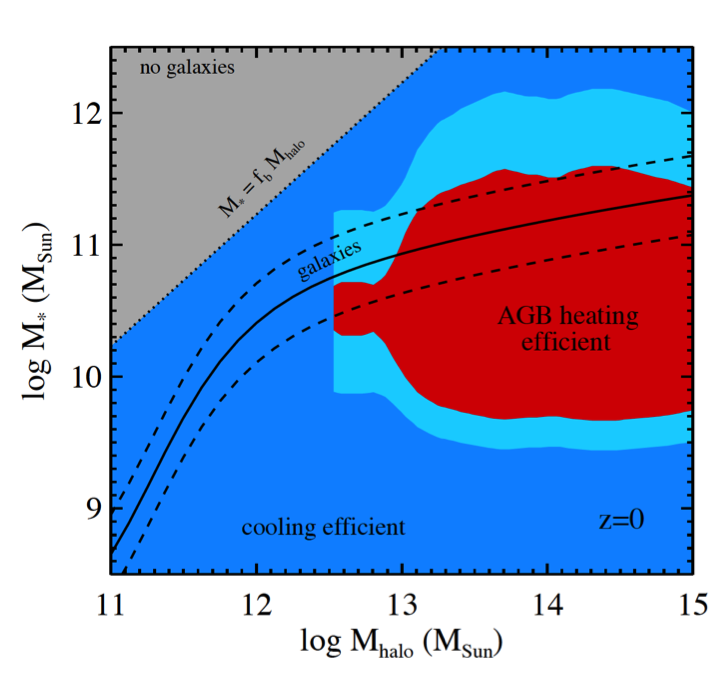 The authors find that AGB heating could overpower radiative cooling in many galaxies (see Figure 2). The most important factor in determining the balance is the total halo mass. Lower-mass halos will have cold, dense gas that will cool much faster than the hot, diffuse gas in massive halos. Redshift was also found to be important: at higher redshift, galaxies have younger stellar populations (more AGB stars) and are more likely to have high velocity dispersion (more rapidly moving stars). Therefore AGB heating should be stronger at higher redshift. They emphasize the importance of including this effect in simulations of galaxy evolution. The authors of this paper pursued a mechanism which could possibly keep dead galaxies from forming new stars: mass ejected from AGB stars moving through the galaxy could heat the ambient gas. They calculated the heat which would be injected into the gas from this process, and found (in many cases) that AGB heating could outpace how fast the gas cools. It is important to note that this mechanism can only keep galaxies dead; other processes are responsible for shutting off star formation in the first place. But these results help explain how galaxies can remain quenched over long timescales despite being surrounded by very large reservoirs of gas. Figure 2a: Results showing the efficiency of AGB heating compared to radiative cooling at redshift z=2. AGB heating is strongest in the red regions, while blue regions show where cooling would overpower this heating. The black curves show where most galaxies lie in stellar-mass/halo- mass space. 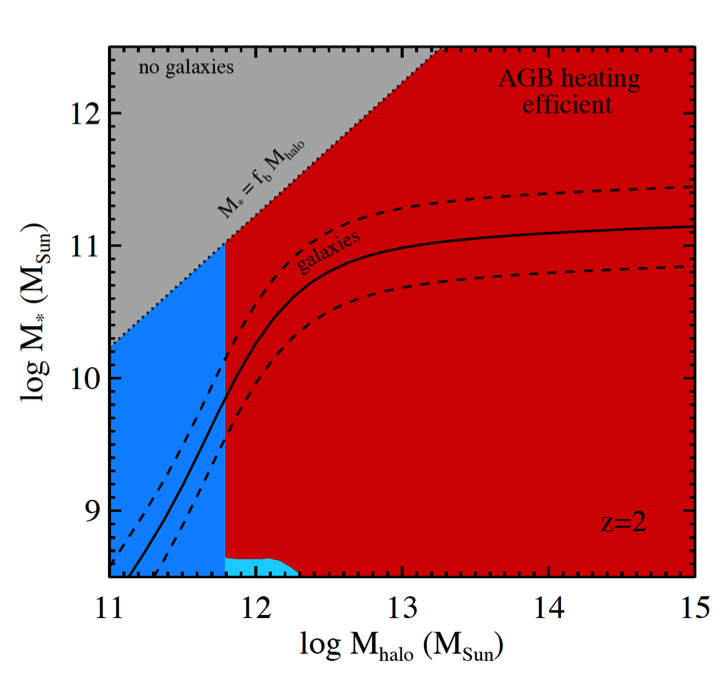 At redshift 2, AGB heating should be significant for most galaxies. Figure 2 from Conroy et al. 2014. Figure 2b: Same as Figure 2a but for redshift z=0. AGB heating is less efficient for many galaxies at these later times. The authors suggest this could mean that previously “quenched” galaxies could see a later revival in star formation. Figure 2 from Conroy et al. 2014. Hints for the Future: Do Quenched Galaxies Reignite? As a final note, the authors point out that as galaxies continue to age, the total mass loss rate will decrease. With no new star formation, eventually the galaxy will run out of stars to go through the AGB phase. 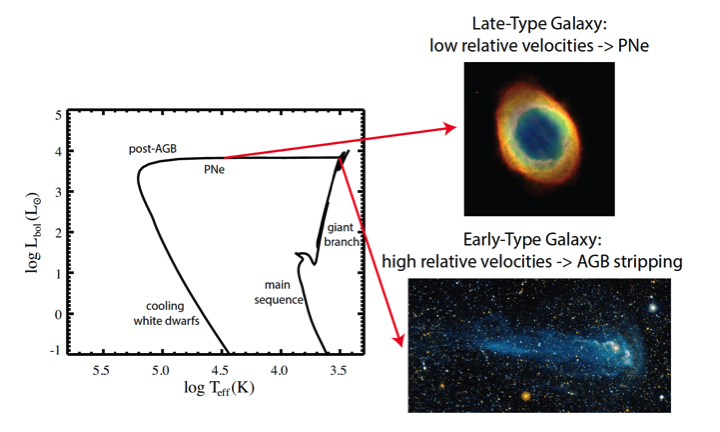 AGB heating may not be sufficient to keep these oldest galaxies quenched: this suggests that some galaxies could show signs of rejuvenating star formation. A few observations hint this may be possible, and if true, it would be a major change in our understanding of galaxies and their lives. Could there be zombie galaxies? Keep your eyes out for new observations on this frontier! Zombie galaxies? Cool! What would the root cause of galaxy rejuvenation be? Is it due mainly to gravitational infall?